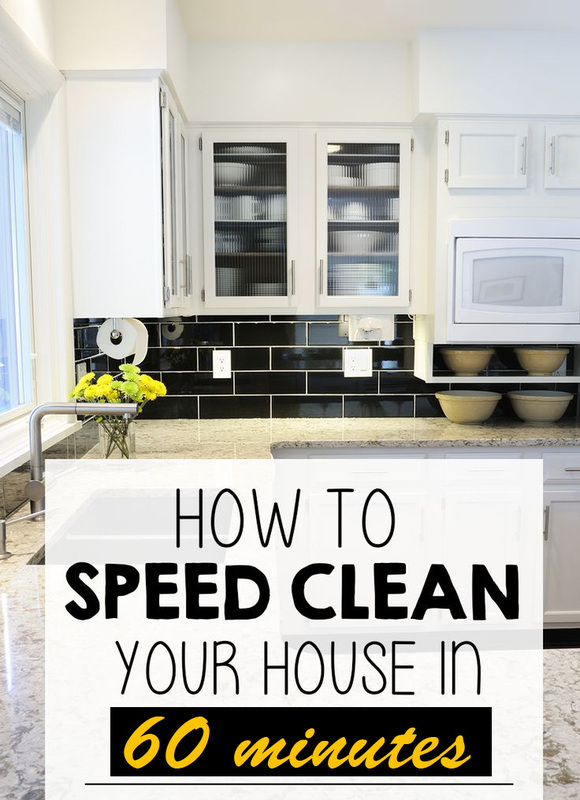 Speed Cleaning – To all those people out there that think cleaning the house is a boring, drawn out process. Cleaning the house can be a relaxing but busy morning but it involves pumping Itunes and a cleaning bucket & supplies, you can knock it over in just 60 minutes! Cleaning the house can be a day long event but the trick is not to let it get to the point of needing a deep clean. Hire Busy Bees to complete a full deep clean then maintain with these tricks and tips. 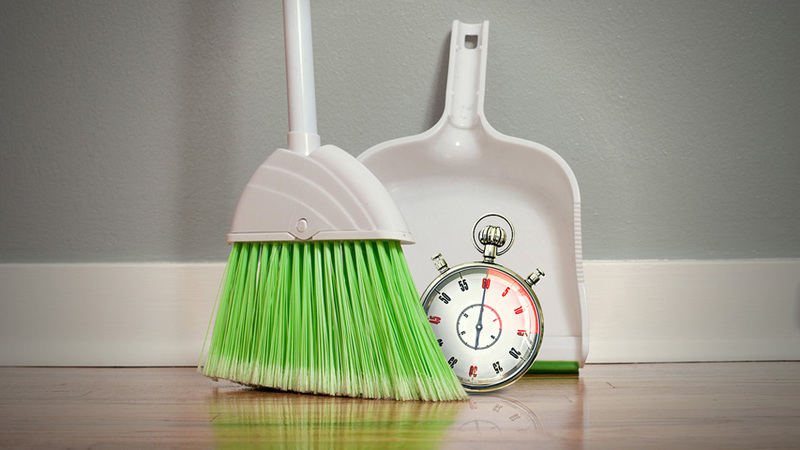 A regular cleaning routine will go a long way in keeping your home clean and tidy. It is much easier to do little cleaning sessions than a huge slog which we tend to avoid. Stay focused on the task at hand, listen to the music, dance like nobody is watching and just get in done – not OCD overdone but staying on track. Start at one end of the home, clean room by room, prioritise if needed. If you have a multi-level home, always start upstairs & travel down. The idea is not to have to return to any one room until finished. Get your tools in order and bring them with you from room to room (your cleaning bucket & supplies & possibly your laundry basket – see below). Keep the sweeping, vacuuming and mopping until the end & then you know there is a finish line. Below is not the order you should clean – determine this by your own home, this is how I do it. Now you need to set the oven timer to 1hour. “Start”! Take a bowl & fill with 1.5cups of warm water . Put into microwave and ‘cook’ on high for about 2-3minutes until steaming. Leave for now. Collect items that don’t belong in the kitchen and place them into your laundry basket. Load and turn on dishwasher and wash and put away any stray dishes in the sink or wash dishes if no dishwasher. Spray the stovetop with degreasing cleaning product (depends on your stove) and wipe down. I have an old-style stove & use all-purpose spray with a micro-fibre cloth and magic eraser around the elements to clean off any built-up gunk. Remember to wipe the stove buttons and dials. Take the bowl from of the microwave, tip out the vinegar and wash and dry the mug. The steam will have lifted off any residue in the microwave nicely, so now all you have to do is give it a wipe. Wash and dry the glass turntable. Give the sink a quick wipe and polish chrome to a mirror finish. Grab your laundry basket and head to the living areas. Put anything in your laundry basket that belongs in the living area away and then gather up anything that doesn’t belong in the living area and put it into the basket. Proceed to dust the entire room – especially the television including the rear and other electronics which gather dust faster than other nick nacks – then wipe down all surfaces. (I spray a little all-purpose spray onto a damp cloth and go for it.) Best to spray the cloth not the furniture. Dust all surfaces and give the table a wipe down. Take your laundry basket into the bedroom, find & put away anything that belongs there – Add anything that doesn’t to your basket. The revolving basket of goodies. Quickly pick up and reassign anything that is out of place. Remember to check under the beds! Dust all surfaces and give them a quick wipe-down. Once all bedrooms are done, gather all the linen and take to the laundry. Give washing machine a quick wipe with a damp cloth, you can use the window cleaning cloth and then put a load to wash. Thoroughly clean shower and wipe down with bathroom cleaner. Remove any stray shampoo bottles & containers etc. Remove brush from lid of toilet bowl and return to canister. Spray the toilet with disinfectant and use toilet paper to wipe down the top and outside of the toilet bowl – I personally use toilet paper as more hygienic that cloths. Wipe down the floor in front of and around toilet before mopping. Put paper into the toilet bowl. Wipe down seat, lid and top of toilet and around back with bathroom cleaner and toilet paper. Put paper into the toilet and flush toilet. You may need a couple of flushes if your heavy handed on the toilet paper – don’t want it to clog. Spray mirrors with window cleaner, wipe and polish with soft cloth. Change towels and bathmats and leave old ones at bathroom door. Put any items still remaining in your laundry basket away. Return laundry basket to laundry along with the towels and bathmats. Quickly spray and wipe any windows that are obviously dirty. Give the entire house a quick vacuum – hard floors, carpet all areas including under rugs. Pay close attention to bedrooms, especially under and around the beds. Don’t forget the laundry. Turn the jug on, make a cuppa (with a biscuit) and leave by your favourite chair along with a good book. Mop all hard floors, finishing at the back door and head out to enjoy your cuppa or nap depending on how hard you worked.